Right, if summer decides not to finally make a grand appearance, I’ll take it into my own hands. Here you go. Summer on a plate. Basta! Seriously, what kind of weather god does this? What have we poor Brits done to deserve these Noah-style downpours?! It’s so depressing it’s not even funny anymore. Like always, the only thing that helps is food! But I’ve eaten so much comfort food that it’s time for a change. I need summer on my plate. I need Italian food! This recipe is so super simple, it actually doesn’t require a recipe. All you need to do is boil the pasta, boil the veg, fry the chili and garlic and toss it all together with some cheese. 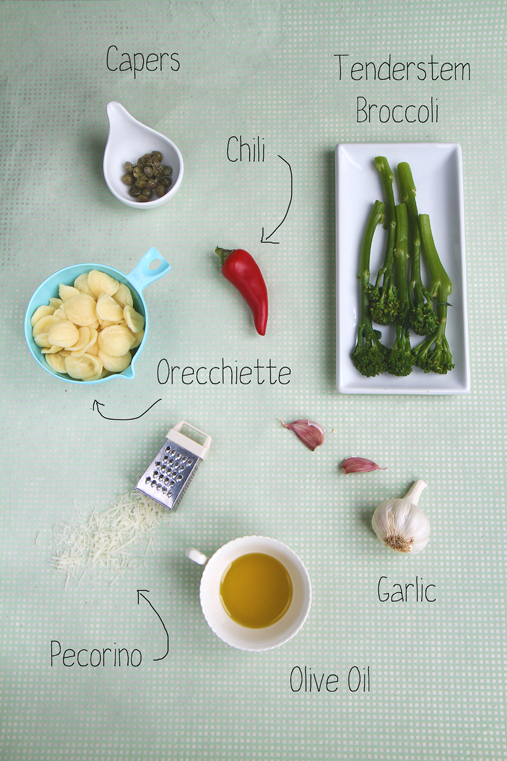 This recipe was inspired by my marvellous friend Valentina, who is really a brilliant cook. She’s been introducing me to proper Italian cucina, and has made me aware that sometimes less is more – and that quality ingredients are key. Now, at the moment Valentina needs a bit of cheering up. Every time I see her, she sighs and says “I am so sad”. How could she not be? Poor thing, she’s a proper Italian – a girl raised on sunshine and heat. And she’s wilting in this horrible weather. So, my dear Valentina, this one goes out to you. May it bring some sunshine into your life. Boil the orecchiette in plenty of salty water according to the packet instructions, making sure that they remain al dente. Boil the broccoli in salty water until it’s just cooked. Meanwhile, heat the olive oil in a pan. Cut open the chili lengthways, remove the seeds and chop into small chunks. Crush the garlic clove and add together with the chili to the hot oil. Fry for a minute, then add the broccoli and the capers. Fry for another minute, then add to the cooked orecchiette. Oh thank you Jaime, that is so sweet! 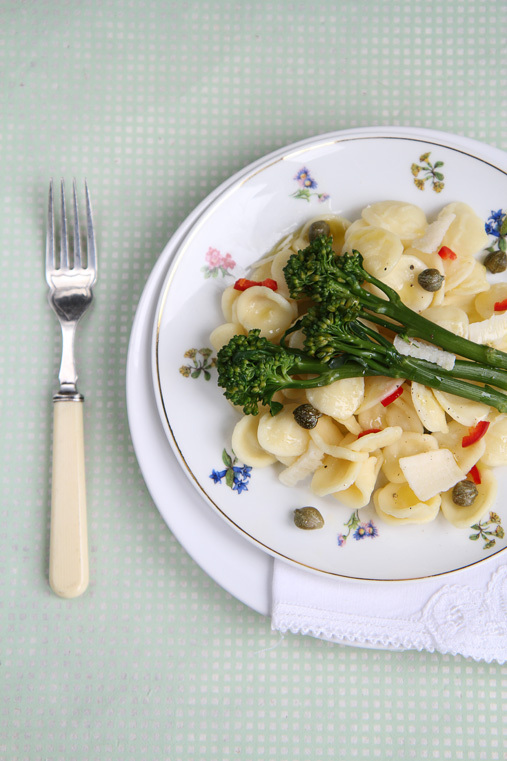 Orecchiette con Broccoli is my kid’s absolute favorite pasta dish. We make it all the time…sometimes using broccoli and sometimes using cauliflower. 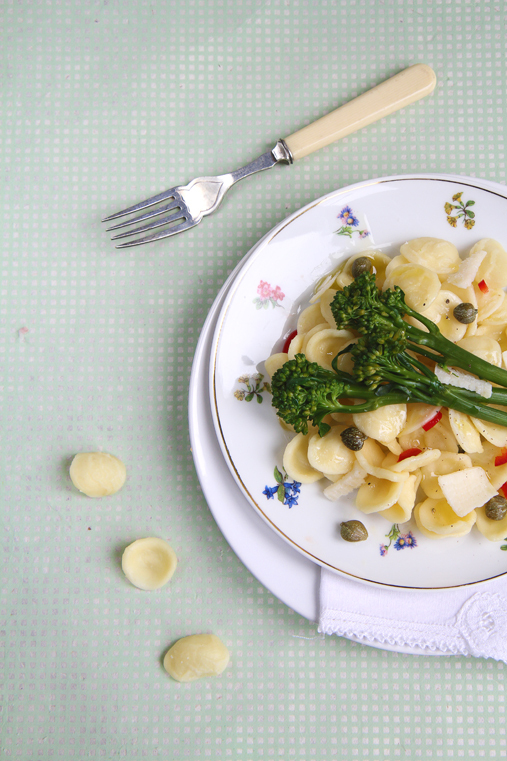 I usually saute some anchovie with the garlic but I’m going to try using capers like you did. Beautiful photos! Ah I never thought of using cauliflower, what a nice idea!